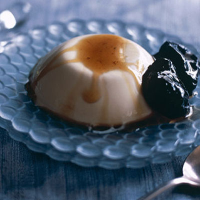 To make the panna cotta, soak the gelatine in just enough cold water to cover. In a pan, warm the cream and the cinnamon stick over a medium heat; do not allow the mixture to boil. Stir in the soaked gelatine and set aside to infuse for 30 minutes. Remove the cinnamon stick and add 70g sugar. Return to the heat and warm through, stirring, until the sugar dissolves. Add 1 tbsp armagnac, divide between 6 moulds or cups of about 200ml capacity; chill for at least 3 hours (or up to 48 hours). Dip the outsides of the moulds briefly in hot water before turning out on serving plates. Sit the prunes alongside and spoon over some of their cooking syrup.